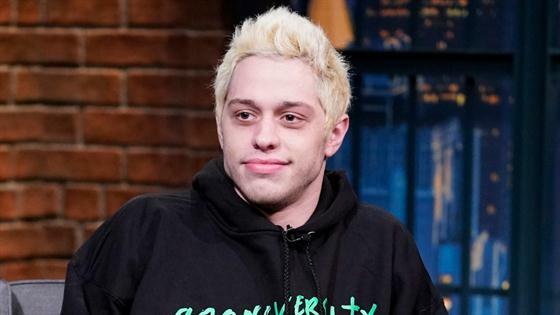 After Pete Davidson shocked fans with a seemingly suicidal Instagram message on Saturday, his friend and co-star Machine Gun Kelly hopped a plane to New York to make sure he was OK. Following a welfare check by police, Davidson made a brief appearance onstage during the live broadcast of SNL. He was one of the first people to leave after the taping and and later joined Kelly as well as two other women in a black SUV, an eyewitness told E! News. The car stopped at the Four Seasons hotel to drop Kelly off. Davidson got out of the vehicle briefly and exchanged a bro hug with the rapper and actor before he went on his way. The group then later dropped off one of the women at an apartment downtown, the eyewitness said. Davidson, who has been open about his mental health struggles, had hours ago posted the message, "I really don't want to be on this earth anymore. I'm doing my best to stay here for you but I actually don't know how much longer I can last. All I've ever tried to do was help people. Just remember I told you so." He then deleted his Instagram account, as he had also done temporarily after he and Ariana Grandesplit in October. "I'm in the plane now on the way to see Pete," tweeted Kelly, who this past summer filmed the movie Big Time Adolescence with Davidson in and around the central New York city of Syracuse. "Gonna make sure he's good, I promise. Can't have my boy in the darkness like that." Grande had also reached out to Davidson after his cry for help, which he had posted minutes after he received some backlash for coming to Kanye West's defense after the rapper engaged in a Twitter argument with the pop star. Davidson has not commented about his alarming post, his latest exit from Instagram, or his mental state. He has canceled at least one comedy show, in Los Angeles.